The Cobargo Folk Festival Team and the Yuin Folk Club are committed to bringing you great live music. Our annual concert series takes a break over summer, when we are at our busiest organising the Cobargo Folk Festival. 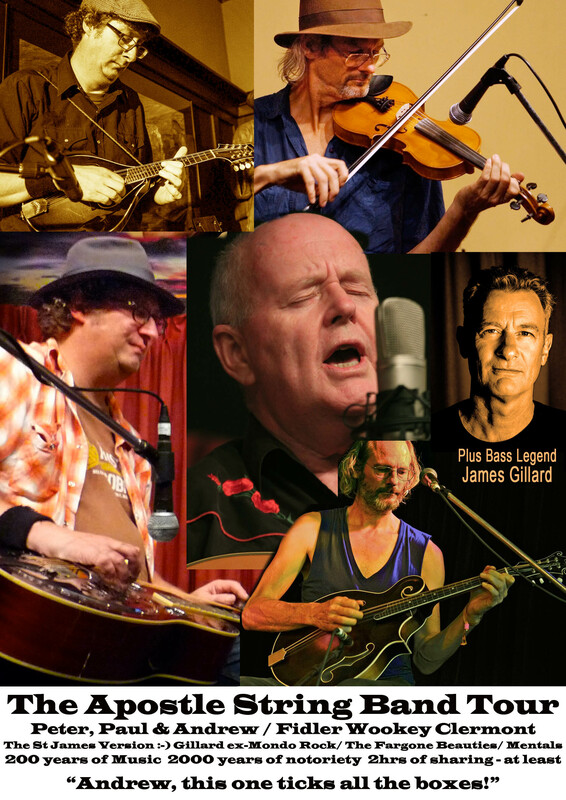 The 2018 concert series featured an incredible line up of acts, including The Apostle String Band – Andrew Clermont, Paul Wookey, Pete Fidler and bass legend, James Gillard in late Oct.
We were privileged to see two great concerts in September and October: former Battlefield Band Alan Reid and Rob van Sante, who delivered a rich mix of trad and original songs together with Alan’s stories about Glasgow, then Richard Gilewitz, a wonderful US fingerpicker on 6 and 12 string guitars. Richard is a great entertainer whose guitar talents are up there with Leo Kottke, Tony MacManus. He will be at the 2019 Cobargo Folk Festival so don’t miss him! The Paul McKenna Band, the award winning Glasgow-based folk group, played the Cobargo School of Arts Hall on Wed 6 June from 7pm. One of the best bands to come out of Scotland in the past 20 years, they put on a fabulous show. The Paul McKenna Band was brought to Australia by Woodfordia Tours (yes, that Woodfordia!) and also appeared at the National Celtic Festival, Port Arlington, Vic. Totally Gourdgeous, the much-loved Melbourne folk act celebrated 25 years of musical mayhem, appeared at the School of Arts on 4 July. We were charmed by the original line-up of Penelope Swales, Mal Webb, Carl Pannuzzo & Andrew Clermont. The acapella performance at the end of the festival was a special treat. The 2018 concert program was kicked off in January by visiting Irish band, BREAKING TRAD, with the awesome Gino Lupari on bodhran and vocals, followed in April with Irish/German band CARA and Cornish bluegrass/Old Timey wunderkind, FLATS AND SHARPS. The Yuin Folk Club is run by volunteers and the money raised at the door goes to pay the artists, funds the sound system and pays for the tea and coffee. Hope to see you there! Help us keep music live in Cobargo!